We have the perfect lawn statue for hunting enthusiasts. It's our hunting gnome, standing ready with his rifle at hand! This yard gnome with a gun is constructed from weather-resistant cast stone resin, so this 15-inch tall man of the wilderness is as tough as he looks. If you're trying to find a unique gift that will be appreciated by an outdoors type or hunting aficionado, our hunter garden gnome will fit the bill perfectly. Putting one of our hunting gnomes at your front door or on your patio will tell the neighbors that you mean business! 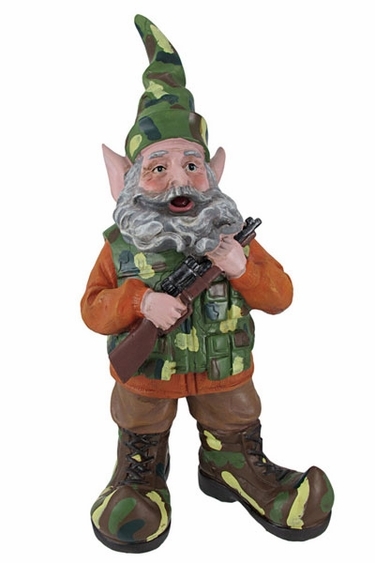 Our garden gnome with hunting rifle might even keep those pesky squirrels at bay, though we can't guarantee that. We can, however, guarantee 100 percent customer satisfaction. With our gnome garden statue, hunting fans will be easy to please during the holiday season. Pairs perfectly with our Female Hunter companion!